It’s been a special summer so far in many ways. I’m pregnant in the middle of the longest heatwave imaginable. Our little boy is starting to speak. In English. I self published my summer travel journal (and it’s selling so well! Thank you guys!). And, I finally signed up for the Children’s Book Illustration summer school course in Cambridge. Ever since my good friend Ellen Vesters went (and subsequently got accepted into the MA), I’ve been wanting to go. There was always a good reason not to do it though. Too expensive. Too busy. A small baby. I figured with a second little dude on the way, it would be now or, well not never, but not for a while. So I closed my eyes, filled out my credit card details (I am pretty talented like that), and signed up. Anglia Ruskin University. Our studios were on the top floor with the big windows. 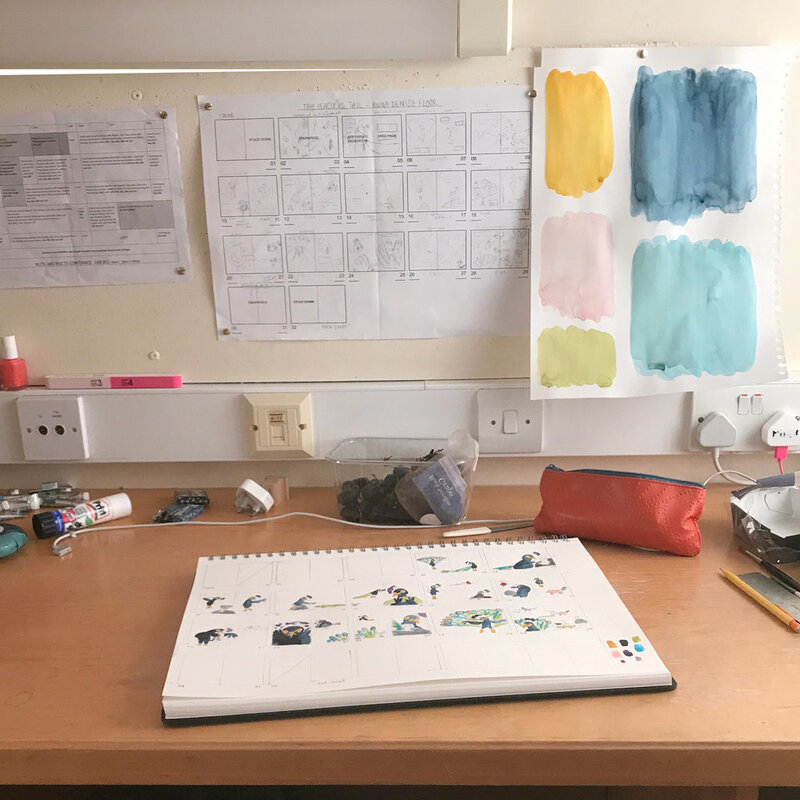 It’s a week long intensive summer school at Anglia Ruskin University in Cambridge (UK) focused on getting you from a story idea, to a completed (but still rough!) dummy of a children’s picture book. There’s an introduction to the history of picture books, lectures on character development, story structure, the interplay between text and image, and a glimpse into the world of publishing and illustration agents. And while you don’t really learn any drawing skills, you do draw a LOT. Pretty much all day. 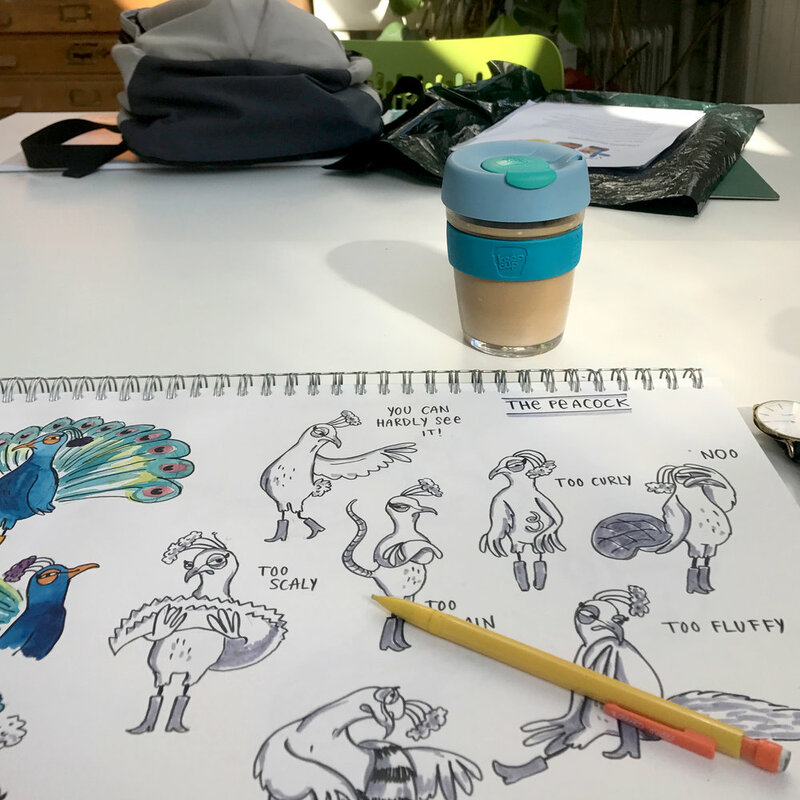 During studio time, the talented team of teachers/illustrators (Pam Smy, Ness Wood, Marta Altés, Dave Barrow, and Birgitta Sif) walk around the room and do 1:1 coaching sessions to help you along in your process. Plus, we got to browse their sketchbooks. 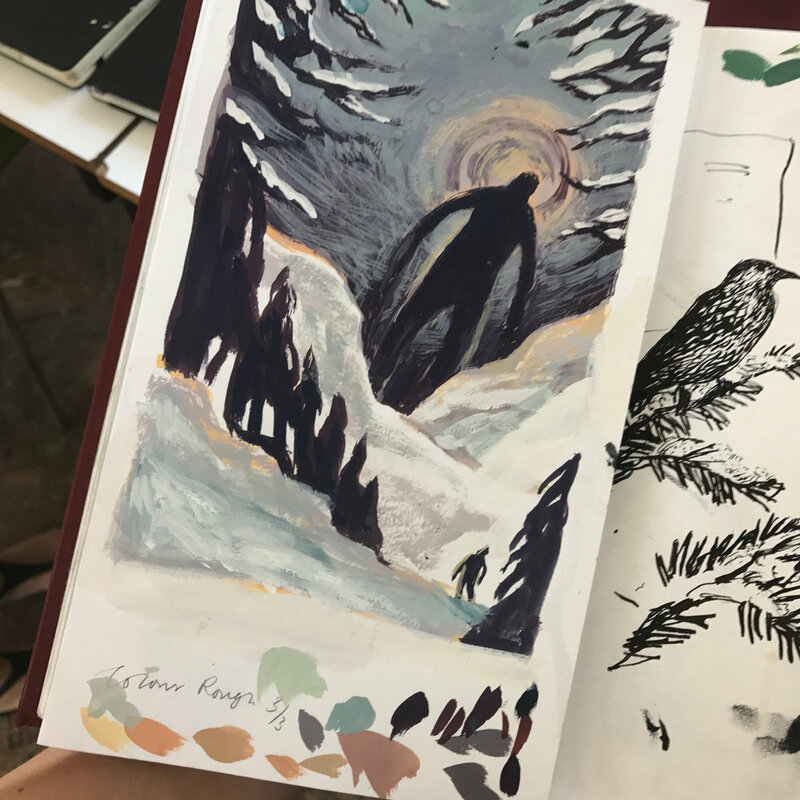 Below are a few pictures I took of the sketchbooks of Pam Smy (1-3), Marta Altes, and Dave Barrow. I KNOW RIGHT? The ‘class’ was about 70 people from all ages, backgrounds, and countries. And while that’s a bit too big of a group to get to know everyone, I did end up hanging out with a lovely and very supportive group of artists all week. It’s so special to meet others who are really into illustration and children’s books and just nerd out together, give advice, and fawn over all of their skill and talent. I am impatient (not a surprise) and like to finish things. However, my work really does improve if I practice practice and practice more and push through this uncomfortable feeling of butIfdon’twanna. Practice makes perfect. Or at least a bit better. Annoying, but true. I hadn’t taken any proper art classes since high school, and I was really craving feedback - more so than I realized. One of the (many) reasons I didn’t go to art school after high school is that my teacher used to just give me straight A’s without looking at my work. I didn’t feel like art challenged me and I wanted to study something that’d be ‘hard’ for me - instead of freeloading off of my supposed ’talent’. Of course, I now know that this was a silly assumption, but at the time I’d only had 18 years of people telling me I was the best. So guess what, drawing all day is challenging and necessary (see point 1). It’s also really really fun. Weird enough, drawing all day was new to me as well, and beforehand I did wonder how I’d feel about focusing on drawing for an entire week. Right now, drawing happens in all the little cracks of time I can find. Toddler nap times, evenings, stolen hours during weekends or vacations. The occasional day off. So who knows? Perhaps I’d be bored by drawing so much, and bored by focusing on one project all week. Fortunately that didn’t turn out to be the case - I absolutely loved the break from ‘reality’ and being fully immersed in a project. Edit edit edit. I’ve looked at my story a thousand times now, had it critiqued, changed it, changed it again, and so on and so forth. The story still needs more work, even though the idea for the story is pretty simple. You really cannot be precious about your ideas and work. A week is insanely little time to produce a picture book dummy. People take months, years, to do this properly. So this course really was only the beginning. I can rely on my sketches and my shapes more, and less on (inked) line work. It can still be powerful and clean. I don’t have to settle for a ‘style’ - there’s more room to improve and develop. I am too old for student housing, and too pregnant for student housing on the top floor in the middle of summer without windows that open. It was lovely staying on campus as it made for lots of socializing time with the other students, but I fully expected to die from heatstroke up in that room (spoiler: I didn’t). Just *part* of my purchases for the week. Yes, absolutely (apart from the student housing)! 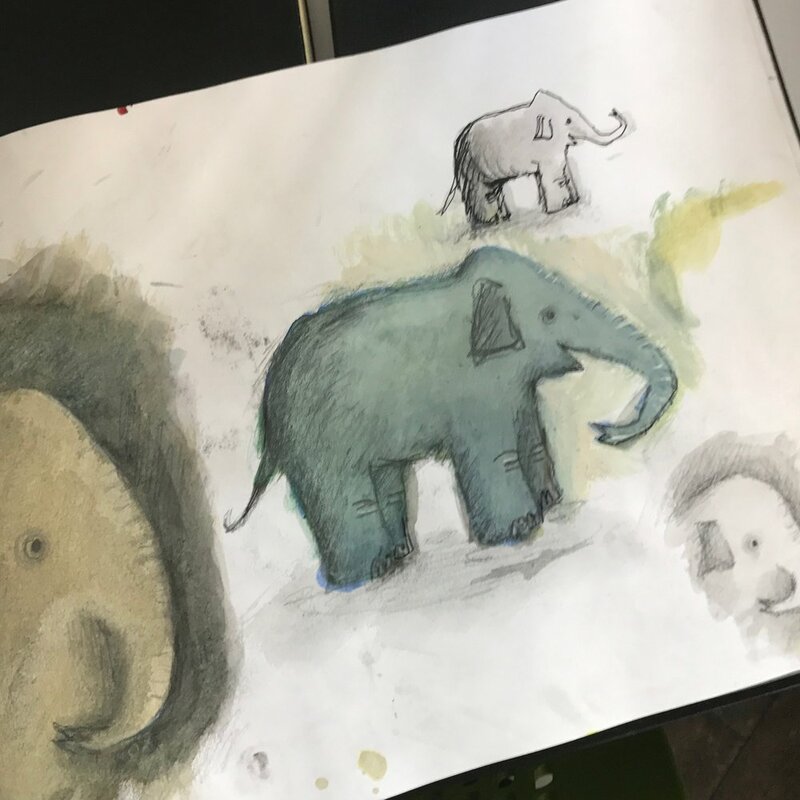 Of course, you need to be interested in children’s books, feel relatively comfortable with your drawing style, ready to work on a story for a week, and open to meeting new people. I am incredibly glad I went, and have been itching to get back to work on my story - which I’ll tell you all about in an upcoming post!